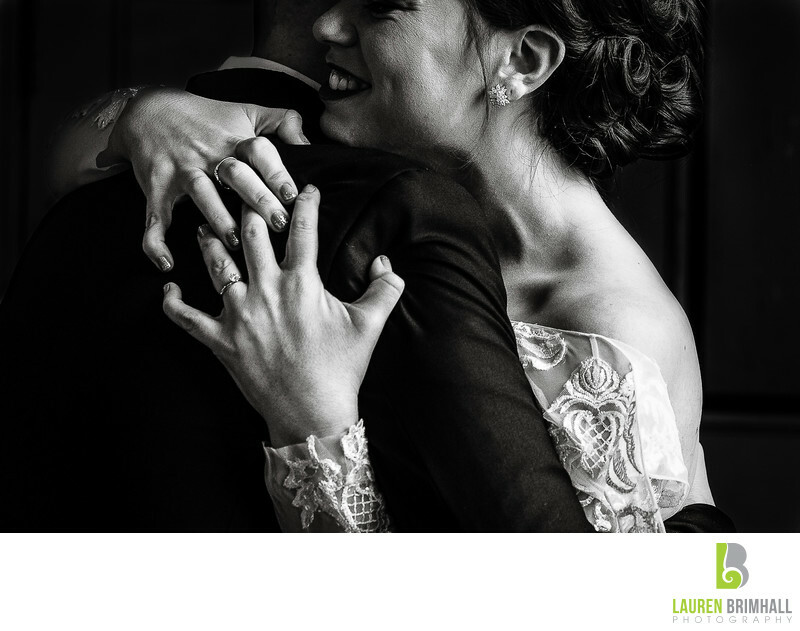 This uniquely composed photograph of a bride’s hands as she embraces her soon-to-be-husband during their first look is one of Lauren Brimhall’s most impactful Fearless-Award Winning images. The gorgeous natural light and simplistic crop really bring this moment to life, as the viewer takes in the authentic tension in the brides fingertips, the corner of the brides delicate lace sleeve, her 1950s curly flapper hair and perfectly soft smile. The choice of black and white and a utilization of a dark background brings attention back to all the most important parts of the image over and over again. The cropped eyes give an air of anonymity to the bride, which allows viewers to envision themselves in her place in the photo. Her engagement ring is another highlighted detail that helps tell the complete story of this particular moment without the need to incorporate so much as a face. The image was taken just prior to the couple’s nuptials at the Metropolitan Building in Long Island City, NJ, which is a storage facility for antique furniture as well as a French-Chateau- inspired wedding venue. A German-born Interior designer converted it to it’s current beauty from the ruins of a Long Island City electrical factory back in 2006.